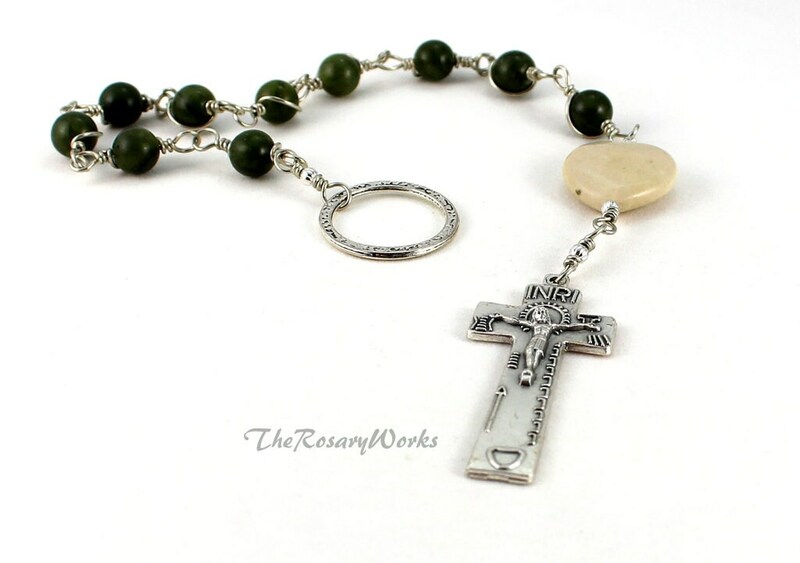 When I see the austerity in Irish Penal Rosaries, I can't help but be reminded of the hardships our Irish Catholic brethren endured during the penal era and of the incredible courage they had in practicing their faith and keeping it alive. It also reminds me to be grateful that I live in a country where people are free to worship according to the dictates of their own hearts. During the penal era of when the British occupied Ireland, it was illegal for Catholics to carry rosaries or other items of their faith. It was at this time that the penal rosary evolved. The finger ring was used to keep track of the decades. The cross evolved to have shortened horizontal arms which made it easier to hide in the hand or up a shirt sleeve. Irish Penal crucifix is loaded with all the symbolism of the Crucifixion. The term "An Paidrin Beag" means the small rosary. The Ave beads in this rosary are 8mm Connemara Marble beads imported directly from Ireland. While there are 4 different kinds of marble indigenous to Ireland, Connemara Marble is the only one that is most commonly associated with the Emerald Isle. These beads are green with darker bands and patches of serpentine. They have a waxy surface which is one of the characteristics of Connemara Marble. Many of the beads are not perfectly round which only adds to the charm of the rosary. The Pater bead is a 20mm x 20mm heart made from Ulster marble which is another marble found only in Ireland. The finger ring is silver colored metal as is the crucifix. The wire is German Silver which is lead free nickle silver. If unused and left in the air, it will darken over time. It can easily be polished with a Sunshine Cloth. With regular use, the friction and oils from your hands will keep it polished nicely. When it isn't being used, it is best kept in an air tight Ziploc bag. GUARANTEE: I am so confident in the construction (wire part) of this chaplet that I will be happy to repair it for free if it should break with normal wear and prayer. However, I can only guarantee the construction of this chaplet. PLEASE NOTE: I can not guarantee the medal, the crucifix, the beads or the bead caps because I did not make them. If one of those should break, I will be happy to repair the chaplet , but I will have to charge to replace the item or items that broke. If the construction (wire part) of the chaplet should break, I will replace the wire and repair the chaplet for free.